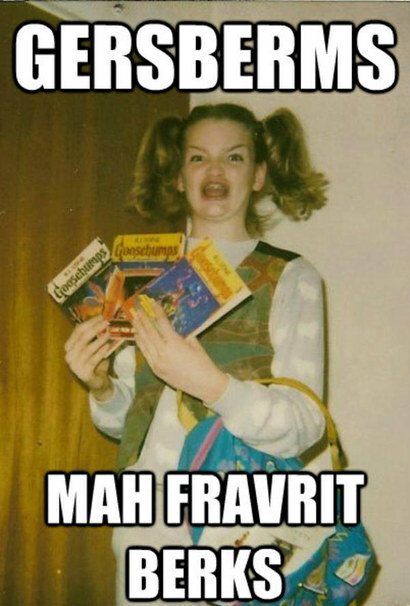 What if the Ermahgerd Girl wasn’t a geeky, Goosebumps loving tween after all? It’s the Vanity Fair article read ’round the Internet this week: reporter Darryn King has tracked down Maggie Goldenberger, aka Ermahgerd Girl, to finally get answers to the most pressing questions of the past three years. Namely: Did she really look like that? How much does she love R. L. Stein books? And how cool is it to be super Internet famous? Sadly, things aren’t what they seem. Turns out, Goldenberger, age 11 in the photo, just liked playing dress-up with her friends and didn’t particularly love the Goosebumps series. Not that any of that matters, of course. “I had no idea at this point how widespread it was,” she tells King. When the meme was first posted in 2012, Goldenberger was backpacking through India and only checking in with family and friends online about once a week. The photo, several years old at the time, had been found, posted and meme’d by strangers without her knowing. Her friends, of course, have entirely too much fun revealing her not-so-secret identity whenever they can. Read the whole story here. And be grateful that a silly picture you took with friends in your awkward days hasn’t been used in this way.